Wood floors are all the rage these days. They're easy to clean, fancy looking, and lend themselves well to ever-changing decor (rugs, etc.). But what do you do when you have old, smelly, puke-green carpeting that has been stuck on your floor since the 1960s? Easy! Assemble the following tools, as well as a small work crew, and follow the steps below. 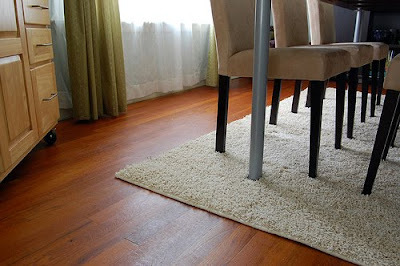 Pull up a small section of the carpeting in a corner of a room to see what the condition of the floor is underneath. This can make or break your project. 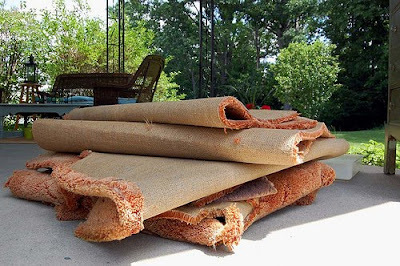 This HOW TO simply covers how to take carpet up and get it out of your home. Floor refinishing is a whole different story. 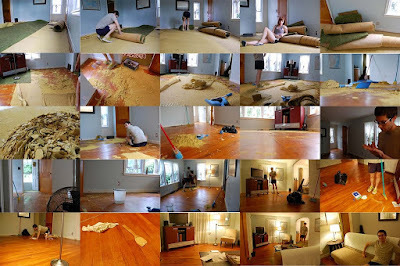 Continue following this process until the carpet is up. You may need to do a lot of tugging and pulling . . . and ripping, etc. Roll strips up and bind using twine or whatever other kind of rope you have around the house. It's also good if you contact your local waste organization to see if there are special procedures to follow at the curb. And if you can, recycle your carpet. If you're lucky, you can follow the same directions to rip out the padding. If you're not so lucky (like us), you may find that the padding is either glued or almost cemented to the floor. 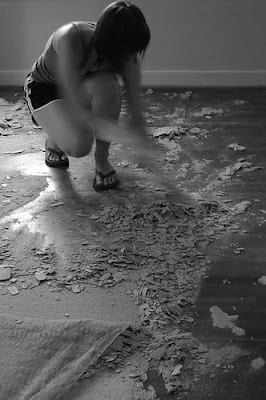 For our rooms, we gently chipped away at the floor to get up the old padding. Slowly with a wooden kitchen utensil (as shown below). This took a lot of patience . . . and a lot of time, but was ultimately worth it. For glued-on carpet, visit your local hardware store and consult with them as to the best de-gluing method. They have lots of options, and you can decide which is right for you. Most people I've spoken with have been able to roll up their padding, so I'll keep this going . . . 9.) This is the FUN part. 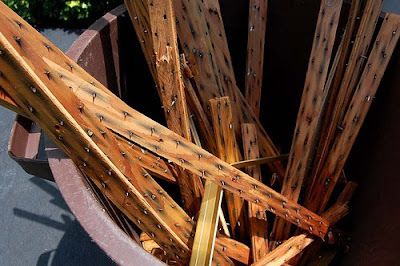 Taking up the tack strip along the side and the staples that are scattered throughout your floor. My husband used the hammer to gently pry under the strip and pull up. It took a lot of time to go around the room this way . . . but it's better to go slowly and cause as little damage as possible. 10.) Next, walk around the room with the pliers and pull up all the carpet staples. Those little buggers are hard to spot, so it's helpful if you go around more than once. 11.) After everything is swept up and taken out, spray a mixture of half vinegar and half water around the room and get down on your hands and knees to wash. 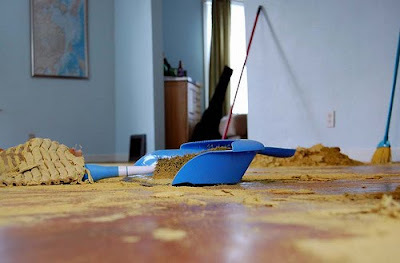 Remember: It's hard work, but you will soon have gleaming, beautiful floors. 12.) To shine things up -- use your favorite wood polish. And . . . last, but not least, ENJOY. NOTE: All floors are different. You may find you need fewer steps to complete your project . . . or far more. And please feel free to leave a comment if you have suggestions!